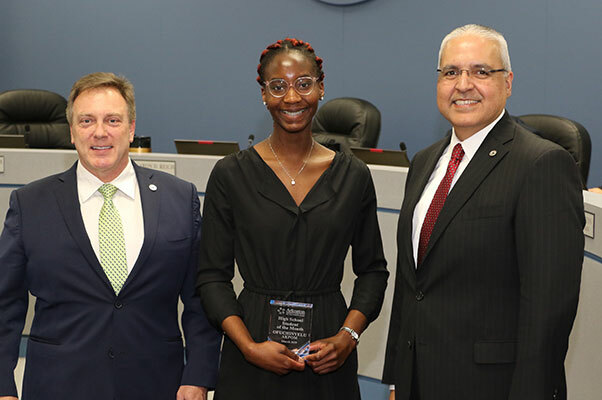 Congratulations to Ofuchinyelu A., the High School Student of the Month from Sam Houston High School! Ofuchinyelu is an exceptional senior at Sam Houston who is a role model as well as a leader among her peers. Over the last four years, she has shown her commitment to scholarship and service to others in the community. Ofuchinyelu is the senior class president, a Richard Greene Scholar, the captain on the Sam Houston basketball team, a volleyball player, and a member of the student council, AVID and Key Club. On top of all of that, she is an excellent student, ranked No. 10 in her senior class. Ofuchinyelu spends her time volunteering at places like Mission Arlington, the Episcopal Youth Committee and Methodist Dallas Hospital. An exemplary student, mentor, student leader and citizen, Ofuchinyelu is a terrific example of a student with Sam Pride who has taken full advantage of all opportunities presented to her. She was recently named a TCU Community Scholar, earning a $260,000-plus scholarship to attend TCU. Congratulations, Ofuchinyelu!